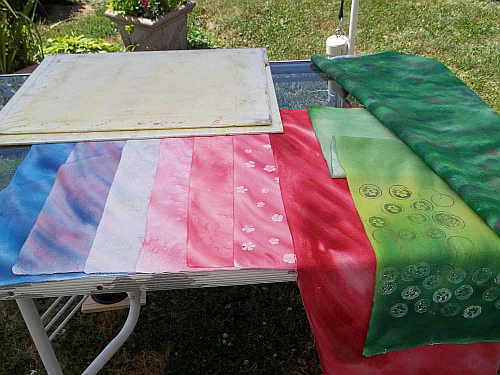 I finally had 3 nice days in a row that were nearly perfect for painting and sunprinting fabric. 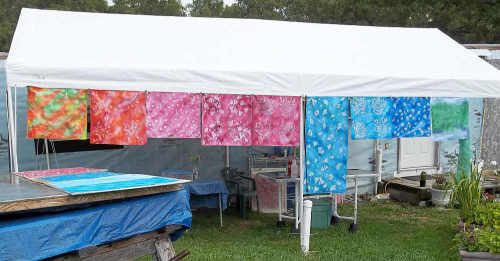 This is the first year in a long time that I have put up my 10ft x 20ft tent outside the front door for painting fabric. In order to do the sunprints I love so much, I need to work in the shade and have easy access to a sunny area for drying fabric. In my early years of puddling with paint on fabric, I used my Easy-Up canopy to give me the shade. I would have to set the thing up in the morning and take it back down when I was done since those are not reliable in gusty, stormy, rainy weather. My “Big Top” is made to be left up all summer for use as a carport or whatever and is shown ready for a painting session above. Securely staked into the ground and attached to the wall of our mobile home, it behaves pretty well. 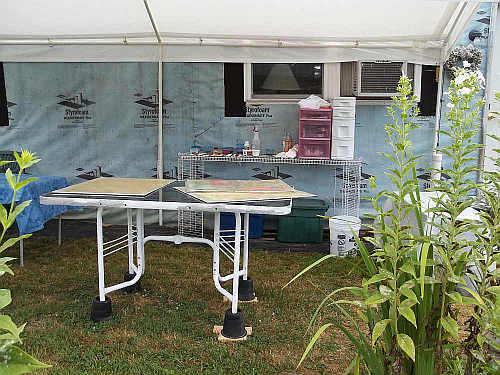 I am able to keep my supplies outside ready to use with very little time or effort.The plastic drawer units and a couple plastic tubs hold most of my supplies. I have been finding myself playing with much brighter and clearer colors than I used to work with. This has been a wonderful change from the last big painting sessions a few years ago when it seemed all I ended up painting were muddy, mucky, mossy colors. I called it my “mud and rocks period”… I would try to start a painting session with “pretty” colors, but seemed to end up with the browns, and mucky greens. The photo above shows one group of fabrics painted back in July. 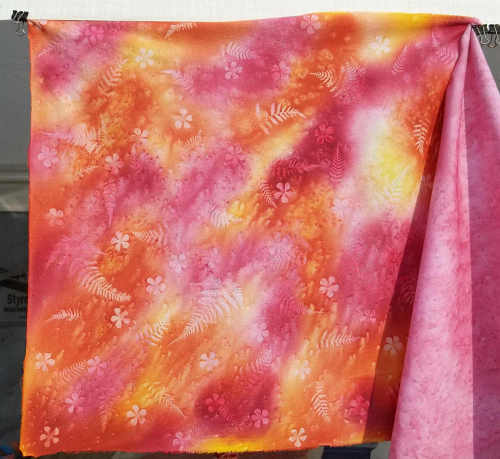 I have been using my Dye-Na-Flow fabric paints which allow me to get deep, bright colors without adding the plastic feel of some other paints. The Strawberry red, hot pink color is a new one for me to use… The light pink piece with the flowers was the first sunprint of the season, done with Phlox florets scattered over the painted fabric. The green and yellowish piece was made for the Arts in the Cards “Cucumber” challenge… I printed it using titanium white and a zucchini cut to resemble a cucumber. I’m not exactly sure why I started playing with the hot pink and orange together, but I have done a number of sunprinted panels with this color combination, am I am finding I like it. 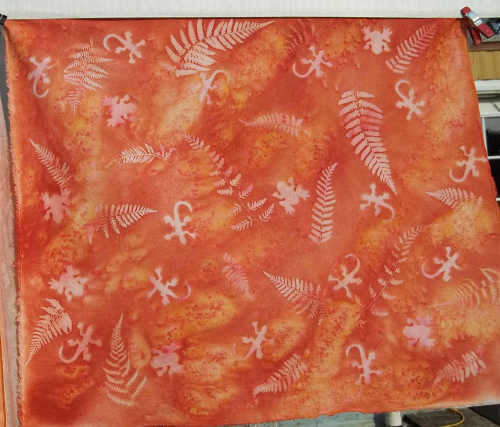 This piece was one of the fun ones I did using foamie lizard and frog shapes along with Ferns for the sunprints on bright tangerine shades. I did end up playing with other bright colors as you can see from the next photo. This photo shows the finished fabrics done on August 25th which gave the “Big Top” a tropical feel. I started out playing with the Orange and Pink, then only Pink, then moved to shades of blue. I even did a couple landcape-ish pieces that are on the far right to use as backgrounds for some botanical applique art quilts. It has felt so great to actually be playing with “pretty” colors again! I like the bright tropical shades much better than the “mud and rocks” of the past!